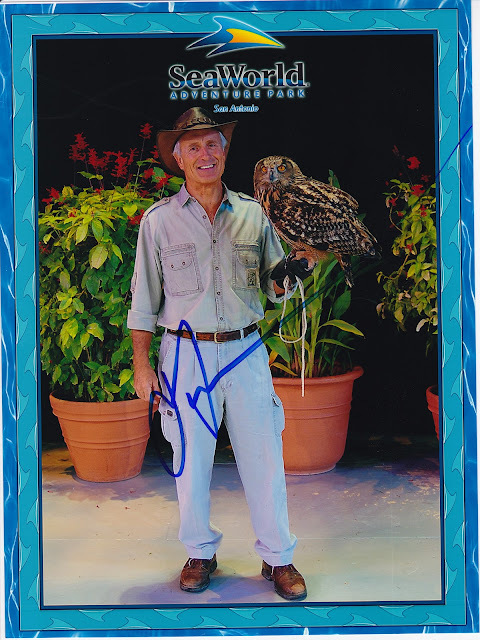 Jack Hanna was at Sea World this weekend. We missed him last year and I love when he (or any of the other animal guys/girls - especially Julie Scardina of SW - are on the morning or late night shows) so I really wanted to go and see what kind of animals he would bring with him. 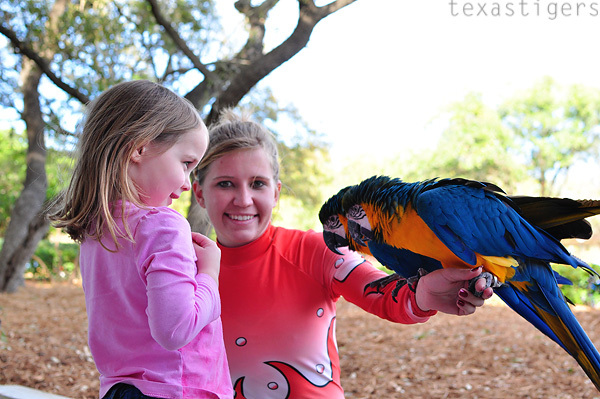 I thought the kids would also enjoy seeing the different animals. We also invited Grandma and Grandpa to come with us and Abby was delighted they decided to come! Since the Jack Hanna show was during Micah's usual naptime I braved it and we skipped nap (he did great!) and we met at the park. We got there an hour before the show and rode the carousel then headed to get a good seat at the show. Since we got to the show early it turned out Jack Hanna was signing pictures (free!) and Grandpa took Abby and got 2 signed pictures. The show was a lot of fun - he seems like a great guy - busy and lots of traveling but he also seems to really like his job (really who wouldn't?) and he also said he spends hours a week signing autographs if anyone wanted one and didn't get one that he'd mail them one - very cool! We headed to play in the Sesame Bay of Play and discovered that once you are up in the net play area it's a one-way road... won't be making that choice again! It's nets you crawl through way up high - and I decided it would be fun to take Micah (and Abby talked Grandpa into going with her.) Micah didn't want to walk/crawl in the net area.... we'll stick to the slide area and the slide area only (besides the water park or the other playground area) but we won't be going in the nets again - or at least I won't. Who wants to take Abby next time she wants to go up there? Then Grandma and Grandpa mentioned they had already seen the sea lions but Abby said but I didn't see them.... so off we went to see the sea lions. She was a little sad because she meant she wanted to see the show but we had already missed that show for the day so the pool of seals and sea lions would have to do. 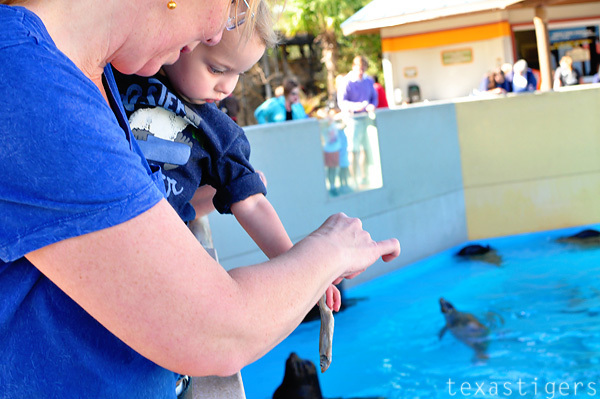 Grandpa made it super special because he got some fish to feed the sea lions. Abby LOVED that! Grandma and Micah threw one as well. Micah only wanted to do one fish - he let Grandma, Abby and Grandpa do the rest of the fish and was content to watch after that. 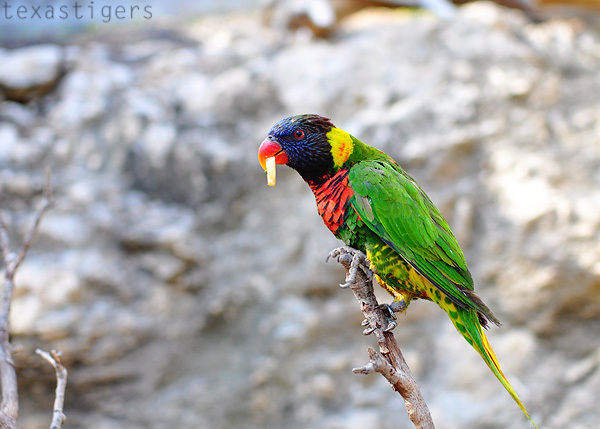 Then Grandpa got some food for the lorikeets. 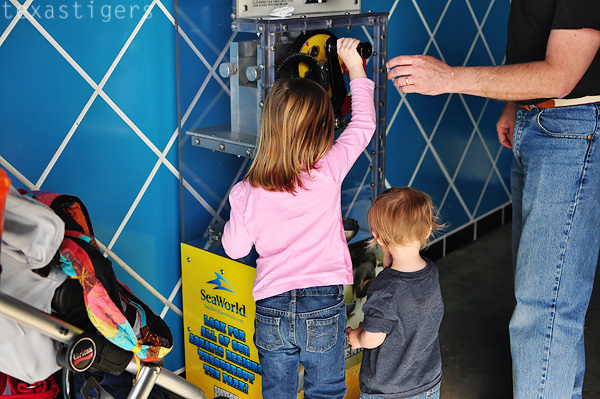 Usually we aren't there during the time they are open (only a 45 minute time per day they are open - 2:30-3:15 pm if you were wondering) We've done this at the zoo but never at Sea World. 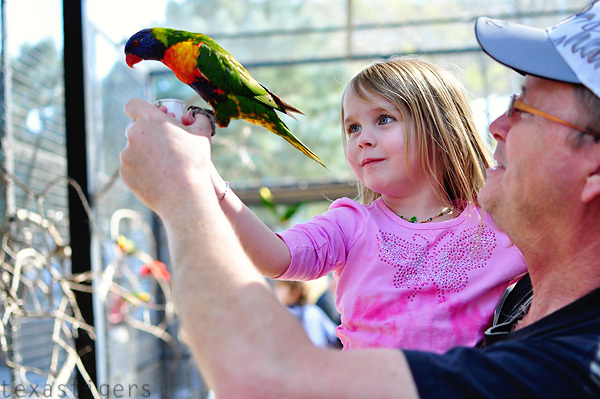 Abby was tickled that the girl at the gate had a lorikeet on her head. 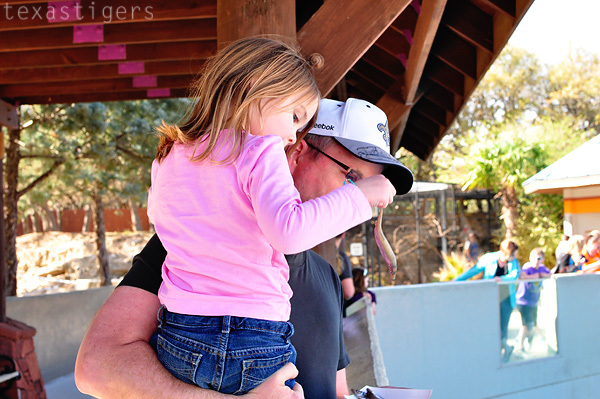 As soon as we got in the aviary one of the birds flew right onto Grandpa's shoulder. Then once that one was done Grandpa and Abby went around offering food to some of the other birds. 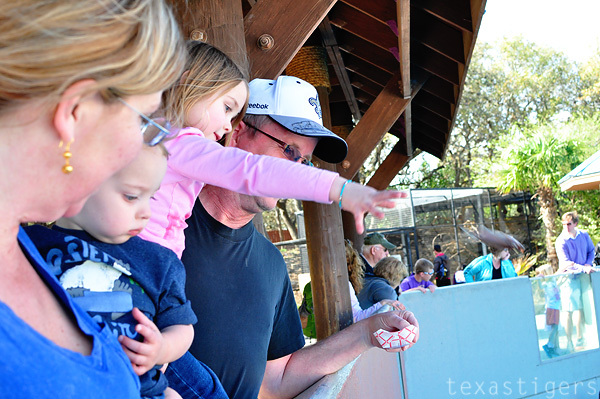 Halfway threw the aviary they were holding out the cup and one flew onto Abby's arm. She was a little taken back at first. 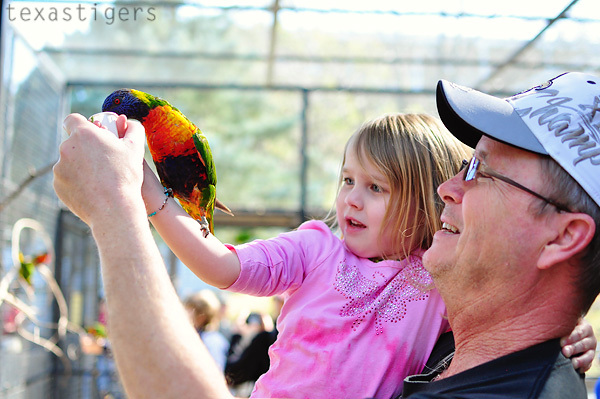 Once the bird was on Grandpa's hand she was very happy with watching the bird eat some of the food. I love this picture! Isn't this a beautiful bird? Next up a different type of bird - the penguins. After going through the exhibit and seeing how much the baby penguins have grown we headed out but not before Abby asked Grandpa if he had any pennies. Ha! Last weekend I didn't have any change (which I very rarely have change on me) and she was disappointed when I had explained to her that the machine flattens pennies with pictures on it but I didn't have any change to do it. This time she was able to get a penny with a penguin picture on it. And we ended our visit with the dolphin and beluga whale show Azul. It's competes with the Sea Lion show for my favorite. It's totally Micah's favorite as he sits there about as still as any almost 2 year old can be watching and clapping "yay!" Before the show they often have someone out with a parrot - this time she had two parrots and Abby got to take a picture with them! 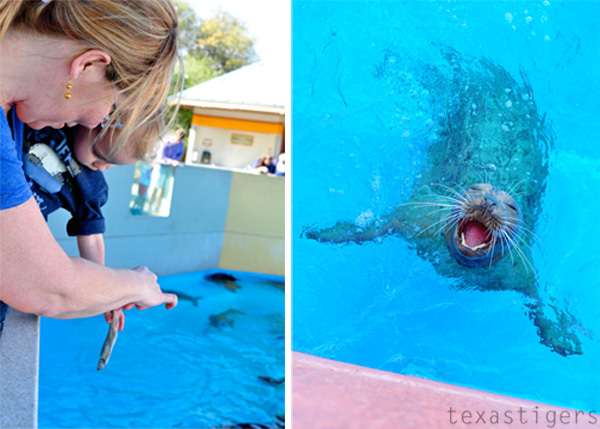 I'm jealous of your sea world adventures! Looks like so much fun. I think we're going to plan a trip to sea world soon, I'm sure it would be a blast.